The architects were Richard Murphy Associates of Edinburgh. Both screens are equipped with 2 Century 35mm Projectors, which are slightly unusual in that they have 3 blade flicker shutters and 3 lens turrets. Dolby SR.D & DTS digital are present in Screen 1. Both screens can show all 35mm film ratios, including silent and have variable running speeds. There are also 16mm projectors for each screen, both Fumeo, and Screen 2 has sep-mag facility from 16mm. Video and slide projection is available, as is PA. Both screens are equipped with 5 deck Strong platters. Both screens have tabs and mobile side masking. Screen 2 also has mobile bottom masking. Cinema 1 has an interesting additional ‘feature’ - below the screen is a window, running the width of the picture. There is metal shutter to the outside, and a matching set of tabs to the inside. The architects idea was that the audience would see a sweeping panorama across the Tay. 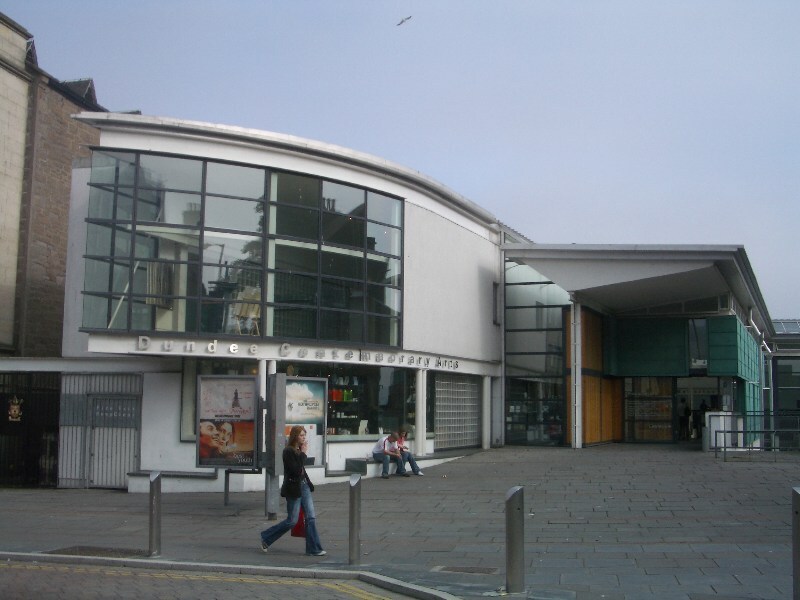 The DCA opened as a replacement for the Steps, which ran successfully in the library theatre for nearly 30 years. The staff transferred to the new DCA.